By Graig Graziosi | May 16, 2018 at 12:01a.m. Rose Jordan warned the real estate agents inspecting the abandoned house next door that they wouldn’t like what they found inside. She watched as the pair entered the 193 Mumford Drive home – which had become a thorn in her side over the past several years – and chuckled to herself a moment later when one of the agents retreated from the old house, thoroughly disgusted. 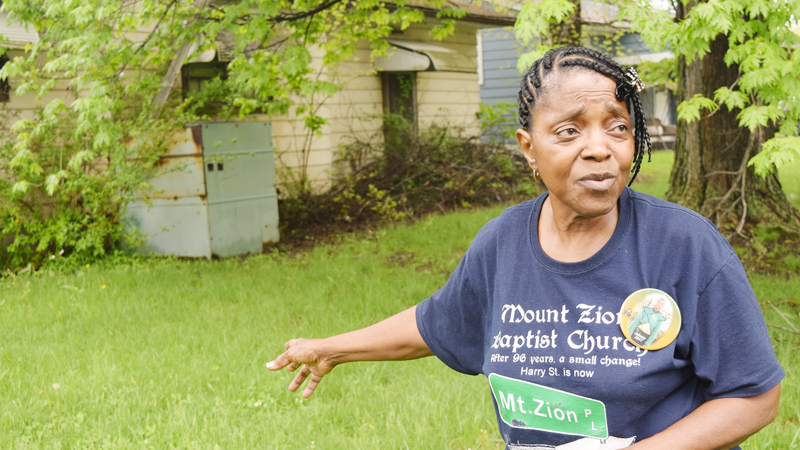 Jordan, who has lived on Mumford for about 30 years, has been lodging complaints with the city about the infested home next to hers for the last three years. She fears that the bugs, rodents and birds living inside the structure will eventually cause long term issues for her and potentially put her family at risk. Brian Adkins, owner of Brian’s Wildlife Control LLC, said houses like the one next to Jordan become breeding grounds for rodents, and that the longer the problem is allowed to persist, the worse the situation becomes. Adkins said the best defense against large infestations in abandoned homes is to keep the structures well secured and for the city to conduct regular inspections. From the street the house looks abandoned but not dilapidated. The rear of the house, however, has several points of entry for both creatures and for water. Jordan said the house was left empty six years ago when the previous occupant’s children moved him into a nursing home, and since that time, the only work that’s been done to maintain the house has been occasional grass cutting. Even that, she said, was becoming difficult, as the individual who mows the lawn won’t cut near the bushes at the front of the house for fear of stirring up the numerous bees that call the bush home. After years of attending neighborhood association meetings and calling the city, Jordan has become frustrated that nothing has been done to remedy the situation. “I’ll take my walker down there and picket the courthouse by myself,” she said. Though it has taken some time, there has been some movement from the city in dealing with the property. Michael Durkin, the city Blight Remediation and Code Enforcement Superintendent, said the process takes some time, but the house is on code enforcement’s radar. If a home is out of compliance with code enforcement, the owner is given a notice and 30 days to comply before they’re revaluated. After the revaluation the home is still out of compliance with city code, then the owners are given a $100 fine. After another 30 days of non-compliance they’re fined $500 and after another 30 days they hit the maximum fine of $1,000. Landlords and homeowners can choose to appeal the compliance notice during any of the 30 day windows if they choose. If a homeowner doesn’t comply after the final fine, the city can begin the process of criminal prosecution. Durkin said until that time, unless the homeowner were to donate the land to the Mahoning County Land Bank, there isn’t much the city can do due to property rights.